Love to Write? Need some focused writing time? Or maybe you just want to get your creative groove back. Like hanging out with other writers? 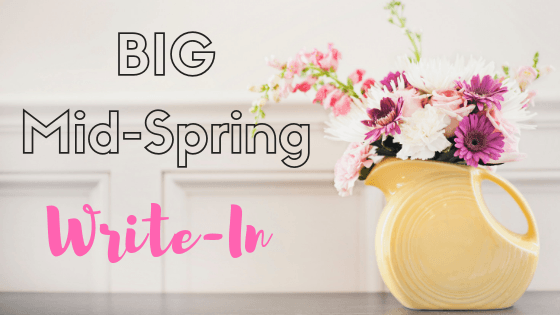 Join me for the big Mid-Spring Write-In - an inspiring one-day writing event that will motivate you to nail your writing goal - no matter how big or small. You'll work on your idea or project. You'll enjoy creativity-firing prompts and delicious coffee breaks. You'll hang out with a bunch of other focused writers who all love to write. NB: Numbers are limited and our Mid-Winter Write-In sold out.